The most consistent problem for Gladstone’s agenda in the Liberal party throughout Gladstone’s years of party leadership ( from 1867 to 1894 with six years of theoretical break after 1874) was the Whigs. Until 1886 this was because they were the leading opposition within the party-afterwards when the Whigs left over Home Rule (that is a nearly independent parliament for Ireland theirs and other liberals defection from the party placed the Liberals previous normal majority in severe danger. The “Whigs" is a loose term for a faction that can be seen as the fairly lineal successor to the party that had provided ( it’s deeper roots in the early eighteenth century are much murkier arguably the “Whig” party of that era is just as much the ancestor of the Tory party). This party had been in favour of oligarchy and the exclusion of the monarchy from party politics and the control of the Royal Prerogative by ministers responsible to Parliament. It had opposed the rather haphazard constitutional settlement and pushed for the narrow but clearer franchise that prevailed after the “Great Reform Act”. It had supported a “widening” of the British constitution to include religious dissenters by holding them eligible for a wider selection of state positions from the bar to membership of Parliament. Generally they took an Erastian attitude to the Church of England that is an attitude that believed Parliament could order the Church of England and it’s property against the wishes of the Church’s officeholders-. They are often identified with a rather sceptical and cynical attitude to religion though it is probably rather easy to exaggerate that –and even some historians who accept that argue that by the late nineteenth century many were in fact pious Anglicans. They generally took a comparatively “reforming” which is to say classically liberal attitude “laissez-faire” attitude to the economy. Tories disagreed to varying degrees with these “progressive” ideas in the early nineteenth century. Thus in the context of earlier in the century the Whigs had generally (they were never a monolith) stood for a distantly “reforming” or leftwing agenda . Gladstone as a Tory had been reared on wariness of the Whigs and his early high Tory calling for a sanctified state in many ways can be seen as a wholesale rejection of and attack on Whig ideology from the right. But by the late nineteenth century the differences between Gladstone as liberal and the Whigs had grown increasingly hard and relevant. At the same time the issues which had once separated Whig and Tory were now increasingly irrelevant to party politics. In particular what had formed the core of Whig progressives was a desire to open up the establishment and centres of authority. But this was combined with a support. This even extended to what one might call a "typical" Whig view of marriage. ~The more aristocratic Whigs tended to take a relaxed view of marriage vows particularly after an heir had been secured. However they tended to be fairly hostile to divorce and were at best unenthusiastic about legislation to liberalise it. These attitudes can be seen in the attitude of their last great leader Lord Hartingdon (later Duke of Devonshire) a notorious womanizer who denounced Charles Stewart Parnell's divorce. While by this point he had reasons for taking a hypocritcal attitude I think actualy it was quite consistent with Hartingdon's general ideology to be relaxed about adultery but highly critical of divorce.Thus they had an overall theme- loosening or opening up established institutions was one thing- dismantling them another. But Gladstone’s reforms went well beyond Whig open to a desire to dismantle these same establishments and centres of authority even to challenge the notions of oligarchy and property that were key to the Whig worldview . This challenged many values that were dear to Whigs; they nearly always supported the continuation of established churches the “hard case” of Ireland gained many rebels when Gladstone disestablished it- . Many of them feared Gladstone’s polices as excessively populist, deep in the worldview of the Whigs was a wariness of democracy and Gladstonians populist appeals and franchise extension stepped on it. Gladstone’s push for reform in the late 1860’s (in alliance with Russell the Whig leader) was stopped by a rebellion among Whigs and his push to extend the franchise in the 1880’s while more successful also was resisted. Increasingly their notions of property were, alienated by Gladstone’s reforms. The confiscation of some of the lands of the Church of Ireland aroused even more opposition that disestablishment itself and there was also great trouble about his land reforms of the early 1880’s. It was Home Rule that precipitated the more or less complete departure of the Whigs- but they departure had been long in coming. Interestingly for all his “radicalism” Gladstone included an enormous number of Whigs in his cabinet- particularly Whig peers (Gladstone’s cabinet tended to be extremely Peer heavy). This is generally ascribed to snobbery to put it harshly or to a belief in aristocratic leadership to put it more positively. Others have emphasised the role of experience though that is a slightly circular argument. I would suggest part of the explanation was to tie leading moderates and members of the Lords which was always the more difficult house for liberal reforms). With them both rewarded by office and invested in the possibility of passage the actual passage of Cabinet legislation was much more likely .This of course meant Cabinet passage was more difficult -but in this Gladstone’s force of personality could play a key role. It’s worth noting that it was after the departure of the Whigs in 1886 over Home Rule that Gladstone’s governments major policy initiatives dried up-it was a lot harder to win elections and even harder when in government to get polices through the Lords . Given this I feel that rational political calculation in Gladstone’s cabinet composition has I feel been a bit neglected. It should also be noted that Whigs properly speaking were not the only politicians to give Gladstone’s problems from the right. Many who at least originally were not regarded as on the right moved there or were alienated by Gladstone’s further radicalism?.This was to reach it’s culmination in home rule but there were examples beforehand. The classic case was Goschen. A key and rather radical member of Gladstone’s first ministry his ardent nationalism and unbending commitment to laissez-faire moved away from Gladstone even before Home Rule he had opposed regulations of employers and franchise extension (he thought te latter would lead to confiscation of property) . 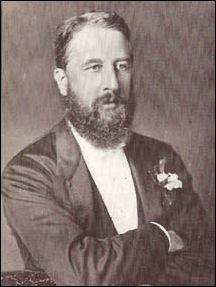 Shortly after his break to Gladstone he was described on Ireland by Lord Salisbury’s niece as “more Tory than uncle Robert”. Even after the departure of the Whigs and many others there remained something of a rightwing to the liberals including Lord Roseberry himself a man with some Whig tendencies. The “liberal imperialists” were already influential and there was a greater support for military spending than Gladstone found acceptable. It was to be over military spending after all that Gladstone formerly resigned from government for good.